News on the clandestine meeting was circulating online these past few days but it's now CONFIRMED by the Thai police. What can I say? It doesn't rain, it pours! BANGKOK: Thai police today confirmed that Swiss citizen Xavier Andre Justo met with a very important person from a Malaysian opposition party before selling classified information belonging to Saudi oil company PetroSaudi International. Royal Thai Police Commissioner of Officer of Information and Communication Technology Lt Gen Prawut Thavornsiri told the New Straits Times here that Justo, a former PetroSaudi director, admitted to meeting the opposition leader at a hotel in Singapore. He however declined to name the individual. Under Thai law, a person cannot be named prior to a warrant of arrest. Prawut later disclosed that the individual was from an opposition party in Malaysia. He also said Justo admitted that he met with a media tycoon at the same location in Singapore. He declined to name the media tycoon. “We have confiscated Justo’s personal computer and we have managed to find documents and information pertaining to their meeting at a hotel in Singapore. He said immigration and hotel records gathered by Thai police corroborated Justo's account of the meeting. He said Justo had also admitted to blackmailing his former employer, PetroSaudi International, and will be charged under Thai law for extortion and blackmail. Prawut however said Justo denied having tampered with documents that were eventually sold to a certain news outlet in Europe. When asked if he had sold the documents to London-based whistleblower website Sarawak Report, Prawut declined to elaborate. “Everyone knows which news organisation I am talking about,” he said. 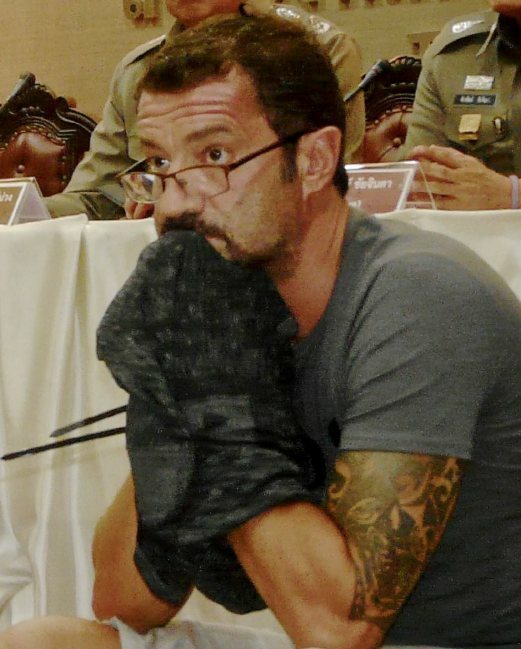 Justo has been under Thai police custody since his arrest late last month after he allegedly stole thousands of emails and documents from Petro Saudio, and tried to blackmail his former employer. He moved to Thailand after he was terminated from the company. Thai police are investigating how, after leaving the company, Justo issued a series of blackmail demands for 2.5 million Swiss francs (approximately RM9.9 million). PetroSaudi did not meet Justo’s demand. Then in February this year, doctored and tampered versions of the emails suddenly started to appear on Sarawak Report, sparking a political row implicating 1Malaysa Development Bhd (1MDB) and Malaysian leaders. So it's Tong, DAP and Tun working hand in hand? Sadly, there is not an iota of proof that any document was tampered with, else your paymaster would have denied it 8 months ago. And parking aside Petrosaudi, did Justo have anything to do with the WSJ? I'd love to see the Thais try to manufacture that one. Rocky .thai police also stated that justo denied the documents were tampered.u dont want tu put it as headline...? Adalah lebih baik Polis Thai menumpukan perhatian untuk perbicaraan Yingluck Shinawatra dan beruasaha membawa pulang mantan PM Thailand Thaksin serta memberi penjelasan persaolan kubur pelarian dan perdagangan manusia di Selatan Thailand yang belum berjawab walaupun sudah berbulan. "This guy came to see me in Kuching twice and I gave him a copy of the email which was sent by Clare to me,” Lester said, naming a man who identified himself as Ramesh Rao Krishnan Naidu, introduced to him by another former Sarawak Tribune editor, Hasnah Abdul Rahman. “Ramesh said he’s a special officer to Najib and said Najib sent him to see me,” Lester recounted of his first time meeting the person he had been speaking to on the phone face to face in June. However, sources from the Prime Minister’s Office confirmed with Malay Mail Online when contacted today that there is no special officer by the name of Ramesh Rao Krishnan Naidu." I think they've got their counter-plot knickers in a twist. Pay one guy to say the plot has forged documents by Clare Brown backed by Anwar, Rafizi and a bunch of Sarawak politicians. This was in London. Then your parallel plot has Tun, Sufi, Tony Pua (? I'm guessing), Justo and this time the documents were NOT touched by Brown. This was in Singapore. Which one do you want??? I hear the reception to Plot A was so bad, that we aren't gonna see any more episodes of Mumbling Lester? According to the Thai authorities, Justo was also visited by a member of UMNO who was trying to purchase the documents. So how? I suppose in a way this is circumstantial evidence that the documents are genuine, no? I believe that the Thai Police Maj. General's s testimony gives the accusation a stronger standing than the similar testimony by Lester, not that I don't trust Lester but by virtue of the official standing of the Thai Police. However, just today, when I mentioned the Thai Police's statement to a friend who tends to be pro-opposition, he immediately dismissed it as a "conspiracy" between police forces which collaborate closely and that with Thailand being under military rule right now, the Thai Police "cannot be trusted". Anyway, this below an article on the matter by Thailand's The Nation newspaper itself (not a syndicated article carried by The Nation). "Swiss man admits to part in smear campaign"
THE NATION July 17, 2015 1:00 am"
"A POLICE investigation into a Swiss suspect, who is being detained in Thailand on blackmail charges, has revealed that his network planned to use distorted information to attack a neighbouring country's government through media in Europe as part of a smear campaign, police spokesman Maj-General Prawut Thavornsiri said yesterday." "Xavier Justo's accomplices include the media and a former key politician of this neighbouring country. Though Prawut did not identify the neighbouring country, it is widely understood that he was referring to Malaysia." "Justo, a former PetroSaudi International executive, was arrested in Surat Thani's Koh Samui on June 22 for allegedly trying to extort 2.5 Swiss Francs (about Bt90 million) from PetroSaudi in exchange for not disclosing confidential information." "Prawut said Justo confessed and handed in all information and evidence, including e-mails and messages via WhatsApp, which revealed that the suspect was part of a network that planned to sell this distorted information to discredit the government of this neighbouring country." "We also found that the suspect's network included the press and a former key politician from this country," the spokesman said, adding that the suspect had received payment for this information in Singapore." "In his confession, Justo provided dates, times and venues of the meetings, which Prawut said had been cross-checked and found to be correct." "This was believed to be part of a plot to discredit Malaysian Prime Minister Najib Razak by using false information about 1Malaysia Development Berhad (1MDB), a state development fund chaired by Najib." "Previously, officials from this neighbouring country had asked Thai police for information, which it could not provide at that time because the investigation was ongoing, the police spokesman said." "Now they can seek information on the case through the embassy," he said. "As of press time, Justo was still in detention at the Bangkok Remand Prison. Earlier, it had been rumoured that police had handed the suspect over to their Malaysian counterparts." "After Justo was arrested, a statement from PetroSaudi said the firm was relieved that the suspect would now face justice through the courts and that it had been the victim of a regrettable crime that had been politicised in Malaysia. "We are happy to finally set the record straight and we apologise to the Malaysian people for the harm that one of our unscrupulous ex-employees has caused to them," the statement read." It will be interesting to see how all this unfolds over time. To those who would accuse me of being a "Najib kaki", let me assure them that I'm nothing of the sort but instead I believe that if one wants to do battle in politics then do so based upon the truth, otherwise one could well lose credibility which is more damaging to one's cause when exposed, especially when one claims to stand for truth, honesty, non-corruption and transparency. Datuk Seri Mohd Najib Bin Tun Abdul Razak, BENAR atau TIDAK duit berjumlah lebih kurang RM2.6 Billiondimasukkan kedalam akaun peribadi anda di Ambank? "...doctored and tampered versions of the emails...". Are you sure or you are just repeating hearsays from others? This is what you call "shooting the messengers" when you hate the message being delivered. If the info Justo gave the malaysians, VIPs or otherwise, reflect the truth of the matter, whats so wrong about these so called clandestine meetings? Yes, those meetings took place......but why all these hoorays and yahoos as if you all just won the lottery? Nobody wants to ask Big Daddy (aka the US Federal Reserve) if they monitored the alleged US Dollar transfers from private banks in Singapore to accounts elsewhere, including Malaysia? The US Fed knows exactly, because it controls the US Dollar clearing system, who is remitting US Dollars and who the receiving party is. So, if individuals and organizations were involved in suspicious high-value US Dollar transactions, the Fed would know. Which means that it has rock solid documentary proof that the transactions in question did happen and when they happened. But that's a sensitive issue, isn't it? What is going on here? Why is Justo being held in Thailand when the who, what , when, where of the 'alleged crime' is not related to Thailand. Why not just extradite him back to Malaysia for the legal process to commence. Since UMNO media propaganda is saying that this meeting means it is a conspiracy, so we can also conclude now that Najib's meeting with Saiful was also a conspiracy. By the way, in view of Justo meeting with our opposition members, it means that 1MDB did not borrow 42b and can't account them for and Najib did not receive 2.6b in his personal account. Only lembu of UMNo will believe such! Apa masalahnya kalau jumpa. Yang penting tak buat salah. Just borrowed 42 billion unnecessary. Will need a more convincing arguments that you are not incompetent. Nak spin pun tengok tengoklah. The jury is yet to be convince. Try again. Malaysias always denial is usual.